You’ve always dreamt of watching the worldwide famous Santorini sunset. Right? The millions of tourists that visit Santorini every year probably share the same dream with you! And how couldn’t they? Santorini is an incredibly beautiful and photogenic island! Full of blue-domed churches, whitewashed cubic houses, luxurious hotels built right on the edge of the caldera and infinity pools, you’ll quickly fall in love with it- if you haven’t already, which we doubt. Besides, it’s not a surprise that Santorini has made a name as a top destination for romantic holidays! To be honest, the reasons to fall in love with Santorini are way too many. We managed to create a shortlist though. Keep reading to dive into the magic of the most famous Greek island! Starting off with a basic one, Santorini caldera is actually the main reason behind the popularity of this island. The caldera is actually the result of a volcanic explosion that occurred over 3,500 ago and changed the shape of several islands, including Santorini. After the explosion, the originally round Santorini was transformed into the island we know today. 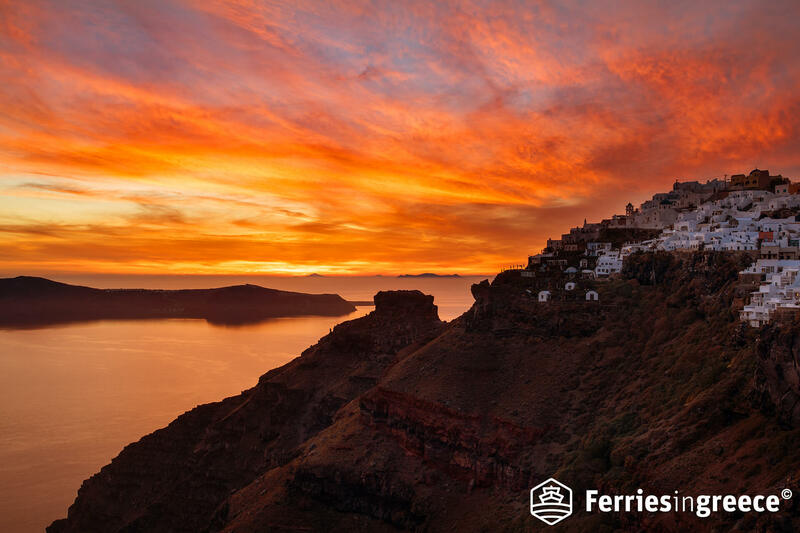 What can we say about Santorini sunset? It’s one of those things that you don’t believe until you see! 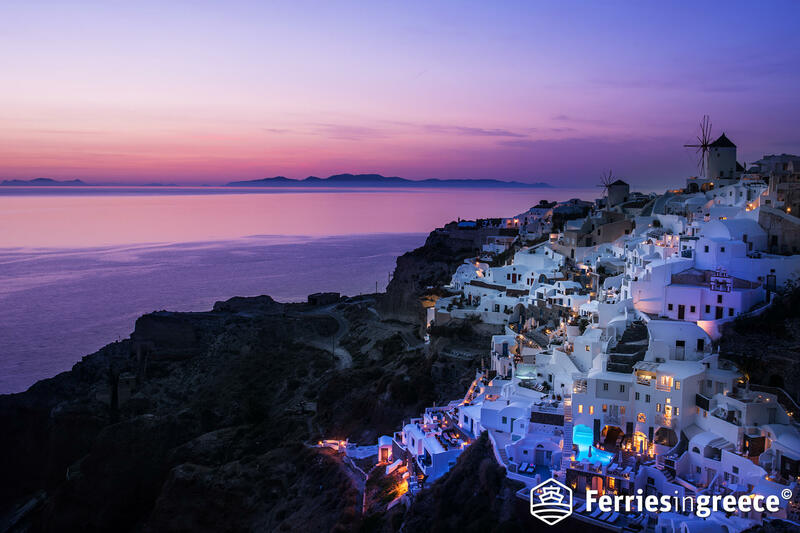 Every evening, thousands of tourists head to the edge of the caldera to witness the miracle of the sunset in Santorini. When the sun dips into the vast Aegean sea, the sky above and the sea below fill with a feast of colors. All the shades of yellow, orange, pink and lilac create- just for a few moments- an unbelievably beautiful scenery, bathing the caldera with golden light! 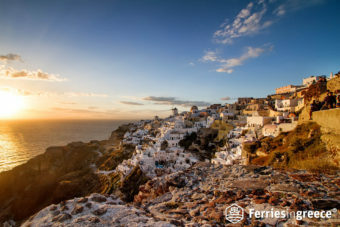 The best places to watch the sunsets are hands down, Oia and Fira. Given that these picturesque villages are perched on the caldera, they boast an amazing view to the Aegean sea and the sunset. Due to their ideal position, these two villages often overflow with tourists, who try to snap a photo of the glorious sunset. Is there an alternative for those who want to enjoy the sunset away from the crowds? If you want to watch the sunset from the island, Imerovigli and Ammoudi boast amazing sunset views. If on the other side, you’re feeling adventurous, you can watch the sunset from the sea. There are no words to describe the feeling of being surrounded by colors as you sail around the island’s coastline! Oia Santorini is arguably an incredibly photogenic village! 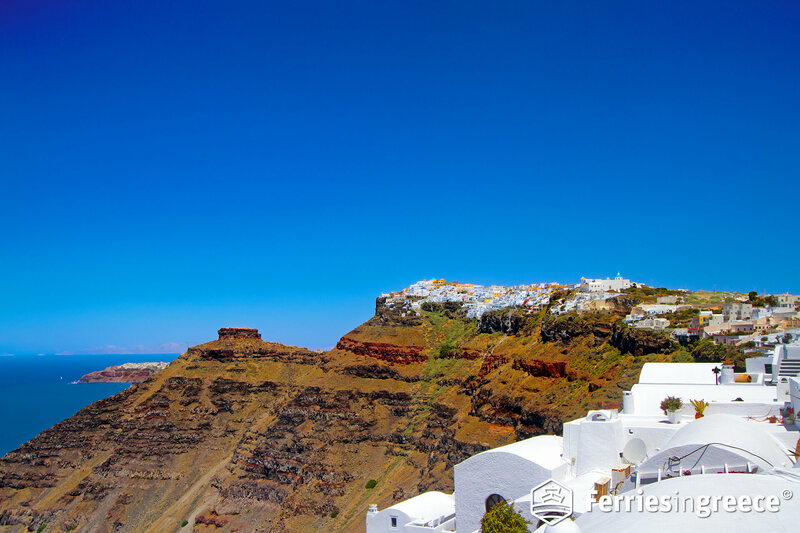 Located on the north side of the island, Oia boasts the traditional Cycladic architecture! Full of whitewashed houses, narrow paths, and blue domed churches, it’s not a surprise that Oia is one of the most photographed destinations in Greece! What’s more, Oia has a lot to offer in terms of accommodation. In Oia, you’ll find a great selection of luxurious hotels, studios, and villas built on the edge of the caldera, offering a breathtaking view of the vast Aegean sea. Tip: For the ultimate luxurious accommodation experience, we recommend you book an Oia hotel with a private infinity pool. You can thank us later! The several volcano eruptions that affected the island have resulted in some stunning volcanic Santorini beaches. Boasting a lunar scenery, the island’s beaches are arguably some of the best beaches of the Cyclades chain. Thanks to their volcanic origins, most of them have red or black sand and pebbles, steep cliffs and an otherworldly beautiful landscape. Red beach is one of the most scenic beaches of the island. True to its name, it is insulated by steep red cliffs that create a unique ambiance. It’s not a surprise that many visitors stand on the road above the beach just to marvel at the view and take a photo of the beautiful setting! Another popular beach is the Black beach (or Perissa beach). As its name indicates, this is a black lava beach with black sand and crystal clear waters. The standout of the beach, though, is Mesa Vouno, an enormous rock that emerges from the sea! Other beautiful Santorini beaches are Kamari, Perivolos, Agios Georgios, Vlychada and Cape Columbo! Fira is the wildly popular capital of the island. Hanging from the Santorini caldera, Fira boasts a terrific view of the vast Aegean sea and Santorini volcano. What’s more, it is one of the best spots to watch the infamous sunset. Located on the western part of the island, Fira is a cosmopolitan village- in a different way than the neighboring Mykonos, though. It is full of gourmet restaurants, luxurious hotels, sophisticated bars, and designer boutiques that give a glamorous vibe to the village. Stroll around its narrow alleys… Indulge in a shopping spree at its shopping center… Visit its museums… Sip on cocktails at its bars… Fira will exalt your spirit! 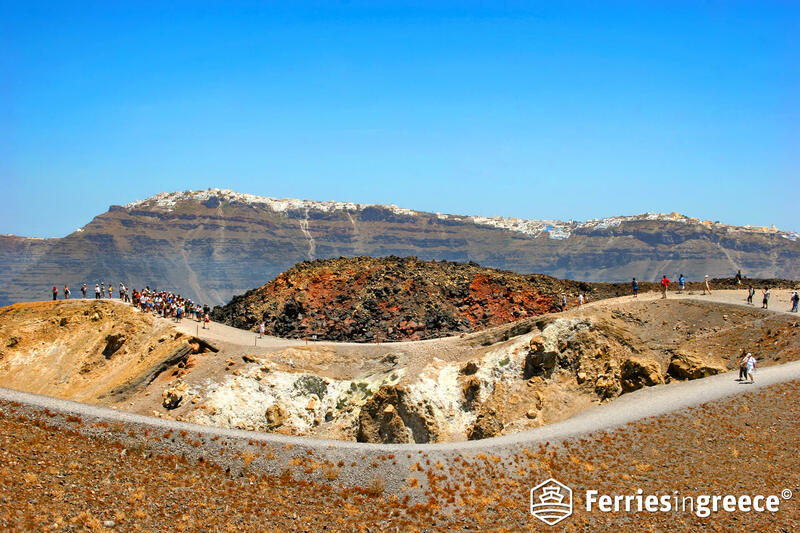 Santorini volcano is arguably one of the standouts of the island! The results of the volcanic eruptions that occurred in Santorini are obvious all around the island, from the lunar beaches to the impressive caldera. The secrets of the volcano hide in the islands of Nea Kameni and Palea Kameni. A visit to these two volcanic islands is one of the best things to do in Santorini! You can reach Nea Kameni and Palea Kameni by boat- there are lots of small boats that depart from several villages. 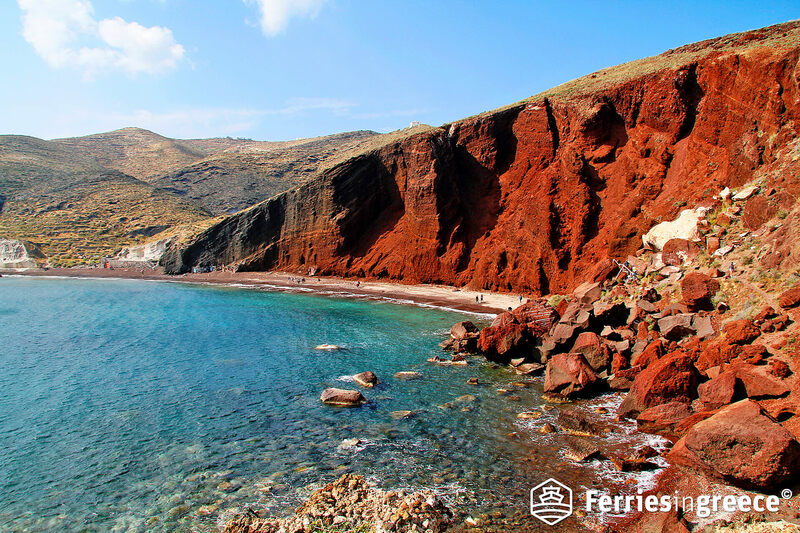 You’ll stand in awe before the volcanic landscape of Nea Kameni and Palea Kameni. At these two islands, you can walk on lava rocks, explore the volcano’s crater, give yourself a natural spa treatment in the hot springs, which are rich in sulfur. It’s not every day that you get the chance to walk on a volcano, is it? To be honest, there are many more reasons to fall in love with Santorini. But we think it’s better to stop here. Breathtaking sunset views, lunar beaches, an ancient volcano, luxurious accommodation…Santorini is a world unto itself! 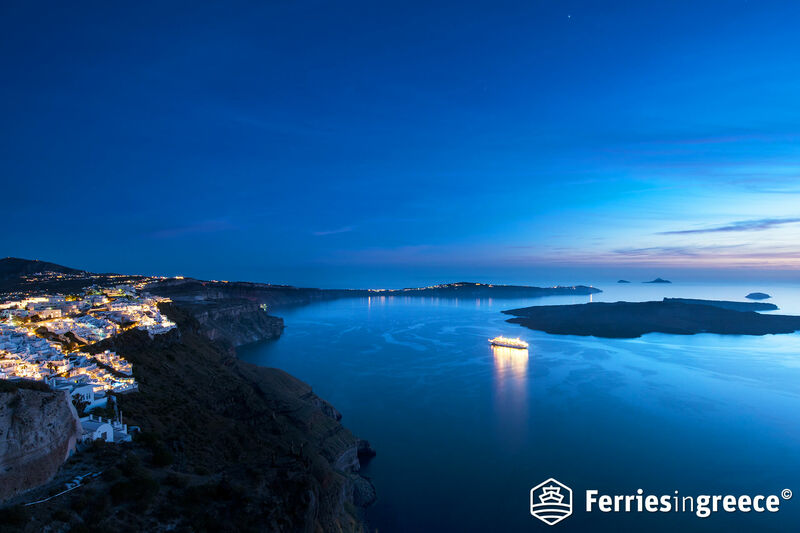 Book your ferry tickets to Santorini and let the adventure begin!